Sun seekers and patio lovers have a refreshing summer ale from Beau’s All Natural Brewing to try out at LCBOs and select restaurants and pubs across Ontario starting this week. Patio Saison, a 5.9% unfiltered Belgian-style ale, is satisfyingly both dry and refreshing. The beer offers up mild pepper-and-clove spice in harmony with the citrusy zest of organic orange peel, and the floral aroma of organic elderflower. “The saison style has its origins in the Wallonia region of Belgium,” explains Beau’s brewmaster Matthew O’Hara. “Traditionally the beer was brewed to slake the thirst of farmhands during harvest time, so it makes a perfect beer for warmer weather,” he adds. O’Hara recommends pairing Beau’s Patio Saison with summer sausage, rollmops, and creamy cheeses served with flavourful artisanal breads such as rye or sourdough. Beau’s originally released Patio Saison in 2012 in restaurants and pubs across Ontario to celebrate the beginning of patio season that year, and the fan-favourite brew also made an appearance in the 2013 Best of Beau’s mix-pack. The fruity character comes courtesy of both the Belgian-style yeast and the addition of dried organic orange peel. The complexity is enhanced with the yeast’s characteristic spiciness and mild earthy undertones. 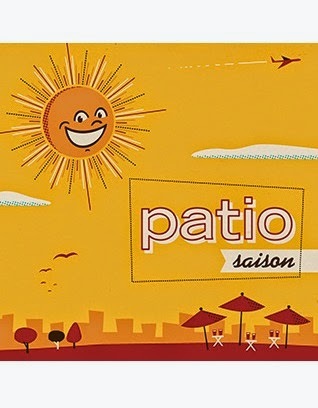 Patio Saison is expected to be available for July and most of August. The 600 ml bottles of Patio Saison retail for $7.85 at LCBOs across Ontario, as well as direct from the brewery, and through home delivery in Ottawa via BYBO (www.bybo.ca). The beer will also be served on tap at restaurants and pubs who pour Beau’s Wild Oats selections: beers designed to explore a range of unique ingredients, bold flavours and exciting aromas. BEAU’S All Natural Brewing is a family-run craft brewery founded in 2006. BEAU’S brews interesting, tasty beers using the highest-quality organic ingredients & local spring water. A member of the Ontario Craft Brewers, BEAU’S is a recipient of numerous international awards for brewing excellence, including 2 GOLD medals at Mondial de la Bière (Strasbourg, France, and Montreal, Quebec); 6 GOLD medals at the Canadian Brewing Awards, 7-times “Best Craft Brewery in Ontario” (2007-2013) and 5-times “Best Craft Beer in Ontario” (2007-2011) at the Golden Tap Awards; LCBO Brewmasters Cup Champion (2013); and “Best Beer” and “Best Brewery” at the National Capital Craft Beer Festival (2012-2013). BEAU’S received a Community Builder Award from the United Way (2013), and was CAFE’s 2010 Canadian Family Enterprise of the Year. BEAU’S flagship and seasonal beers are available throughout most of Ontario. BEAU'S entire line of beer is certified organic by Pro-Cert Organic Systems Ltd, and BEAU’S is a Certified B-Corp.